At deBebians, we love creating new, exciting pieces of jewelry and designing new, innovative styles. One collection that we recently been expanding is our station necklace selection. Our station necklaces were already available in a variety of carat weights, lengths, diamond and gemstone options. However, we wanted to update our collection with even more innovative options. Below are just a few of our newest station necklaces from which you may choose. Our classic bezel necklace has been updated to feature fancy yellow diamonds. This 16 inch 14 karat yellow gold chain is set with 9 fancy yellow round brilliant cut diamonds. The diamonds will weigh approximately 0.50 cttw. The diamonds are set equidistant all the way around the necklace. For an added pop of color to a woman’s wardrobe, why not purchase a ruby station necklace? 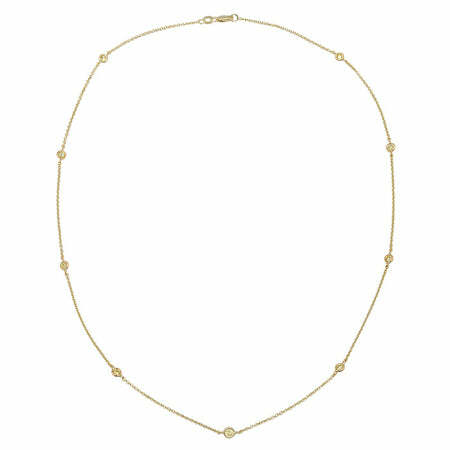 This necklace is made from 14 karat yellow gold and has a 16 inch length. Our station necklaces have a high quality lobster clasp. 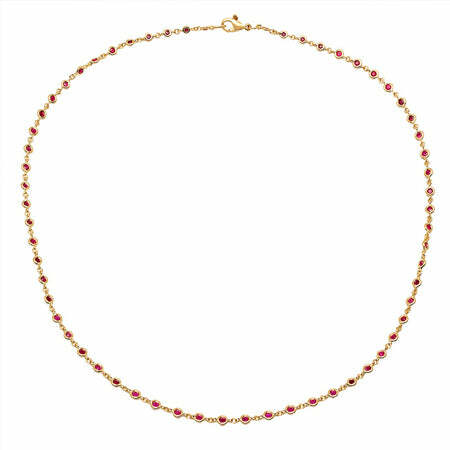 This particular necklace is set with approximately 61 round rubies, weighing approximately 1.83 cttw. One of our most impressive station necklaces features various shapes and fancy colored diamonds. We used a 14 karat rose gold chain with a length of 36 inches. 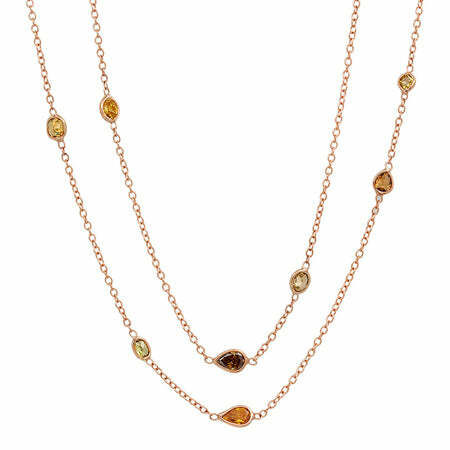 The necklace features fancy orange, yellow, green, & champagne colored diamonds in round, oval, pear, marquise, and cushion shapes.